Mission: To attend the Kilcoy Show and fundraise for the QCWA Public Rural Crisis Fund. 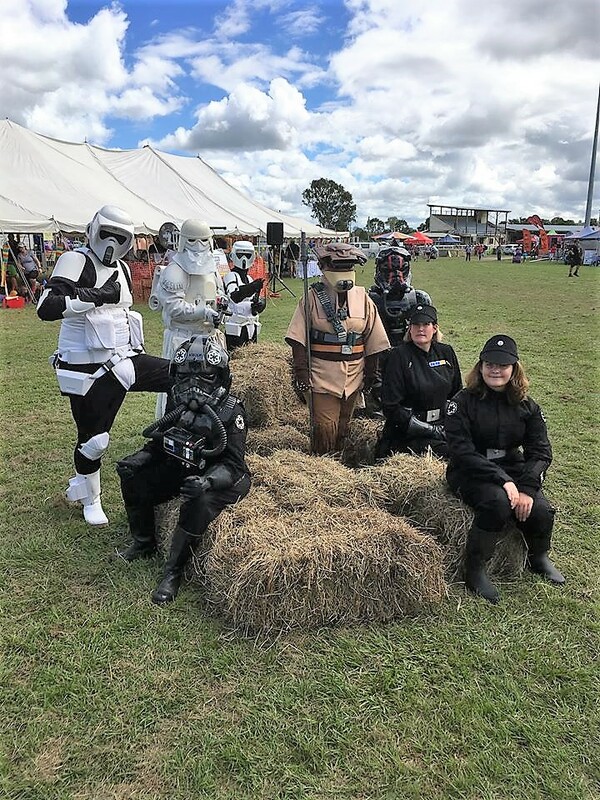 Details: This was our second trip to Kilcoy Show after a successful troop in 2017. The show committee had a better idea what to expect from us, so we were well introduced by the MC, and included in the opening ceremony. We had the option of putting a backdrop up but we were better off doing the roving patrols. A static display would be a good wet weather option for future shows, but that wasn't needed on this occasion. We did deploy the flags for a bit of colour. There was no grand parade this year, so we did roving patrols throughout the day. The crowd was small but friendly. As we saw last time the response from country peope is generally hesitant at first, but with a friendly "good morning" and a handshake the ice is easily broken. And kids are kids, when they are always happy to see troopers. A broken snap left Duras' TK out of action, but he and QBShan did a great job wrangling and taking photos. The charity of the day was the QCWA Public Rural Crisis Fund. They provide support to needy rural families during times of floods, drought, fire, or any type of crisis. With the recent bushfires and floods the charity didn't need any explaining and the locals were happy we were supporting a rural charity. Kilcoy Show also had a group of visiting officials from other shows, and they were keen to talk to us. The feedback from them was very positive, and hopefully they will put in requests for us to troop at their shows. Thank you everyone for the long drives to get there, and for your enthusiasm during the day. A special thanks to the four GA troopers. They were a big help getting photos with little kids and they worked hard all day. Charity Funds Raised: $687.90 for QCWA Public Rural Crisis Fund. Includes $501 from the Kilcoy PA&I Society. Congratulations, nice work again . Nice one guys, looks like a fun troop! Such a great troop! And so happy to have been able to troop with my daughter! A fun little troop again. Glad I attended. A very fun day. Before we departed i spent way too long looking at the show chickens.